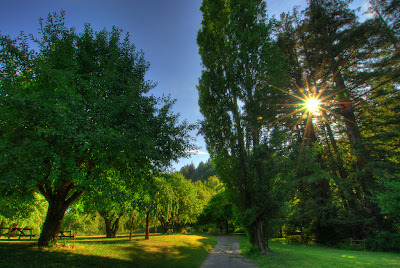 There are a lot of great travel sites on the web that genuinely make travel easier. 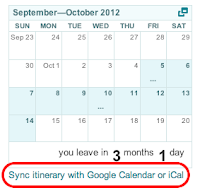 One of the best, is the itinerary organizing tool TripIt. TripIt makes keeping track of flight and hotel schedules a cinch by automatically reading your confirmation emails, pulling out the relavant dates and times, and combining them into single itinerary, accessible via the web and a mobile app. 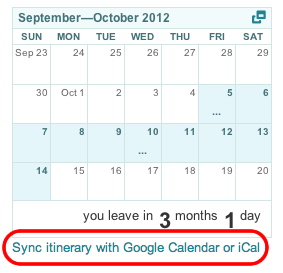 Using TripIt can make planning trips with Planapple even easier. We use Planapple during the planning stage of our trips to collect all of our ideas into one place. Stuff we want to discuss (places to stay, things to do), organize, see on a map, and mark as 'must see' or 'maybe' etc... Once we've got flights booked however, sometimes we forward those confirmation emails to TripIt to see them as a single itinerary. Wouldn't it be nice to be able to import all of that itinerary info from TripIt into your "master" trip plan on Planapple? Well now you can. If you're a TripIt user, Planapple's new "Import from TripIt" feature makes getting your flight details into your Planapple trip plan easier than ever. 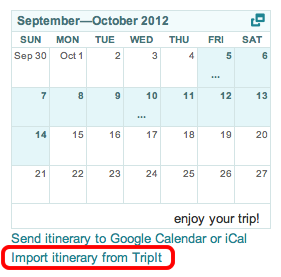 Then just click the "Import itinerary from TripIt" link under the calendar widget on the right side of your trip page. 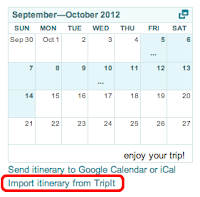 This will bring up the "Import from TripIt" dialog with an input field for your TripIt "calendar feed url." Next you will go to TripIt in another browser window, find and copy your "calendar feed url" on TripIt, and paste it into the input field in this dialog. My wife and I enjoy using Planapple to plan trips, and have been using it for a couple of years to plan everything from weekend 'get-aways' to multi-stop adventures. It's a simple tool that lets us collect cool ideas from around the web, talk about them, make plans, and take them with us on the road. Recently we discovered Pinterest and were struck not only by the breadth of beautiful imagery shared there, but also the variety of cool 'bucket lists' users were creating to catalog the interesting places they want to visit. Browsing through these boards, we thought Pinterest + Planapple would be a great combo to get ideas and inspiration for our next adventure. With the newest addition to our family having recently arrived, we decided to take baby steps for our next trip and visit the relatively close & familiar destination of Sonoma Wine Country in a few months time. We've been to Sonoma many times before and love it, but are looking forward to getting a different perspective using Pinterest as a starting point for ideas. This article will walk you though how we planned our trip using Pinterest and Planapple. Turns out, it actually worked pretty well. Find out more after the jump. A lot of new people have been visiting Planapple recently, and some have asked what the best way is to get started. Here's a simple guide to get you going and show you how Planapple makes planning a trip easier. At its heart, Planapple is a research and planning tool for the web. It gives you a single place to save your research, talk about it with tripmates, and take it with you on your smart phone. Surf the web to find interesting ideas on sites you like. Save those pages to your trip on Planapple with the bookmarking tool. Talk about stuff with tripmates back on Planapple via comments in the discussion section (ie "What do you think of these 3 hotels?"). Organize things into lists, make decisions, and perhaps build an itinerary. Go on your trip and access the stuff you saved on Planapple from the mobile app. Yeah, but what does everyone else have to say? So you're planning a last-minute weekend getaway, and you've both decided Saturday night should be a splurgy, super-special, won't-soon-be-forgotten kind of dinner. You've got it narrowed down to three possible restaurants you found on Yelp, and bookmarked all of them into your Planapple trip. So how to decide? 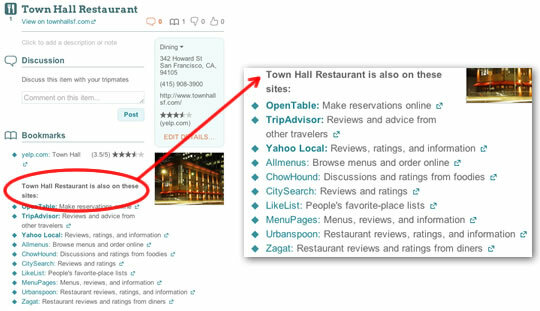 Wouldn't it be nice if you could check the reviews on other sites like TripAdvisor and Yahoo Local, look at a copy of each restaurant's menu, or check on OpenTable to see if there are even reservations still available? "Easy enough," you say, "I know how to use the web." And you could do that. But at Planapple we hate having to repeatedly retype things like the name of each restaurant. And we hate getting to a site and finding out it doesn't actually have any information on the restaurant. So instead, we're going to make Planapple do the work for you. ... some you know, and some you may not have heard of before. But all there, ready for the clicking, without any extra effort on your part. Ta-da! If you're using our bookmarking tool, you know how Planapple makes it easy to keep track of all the travel ideas you find around the web. But did you know Planapple can help you explore the web for new ideas, too? 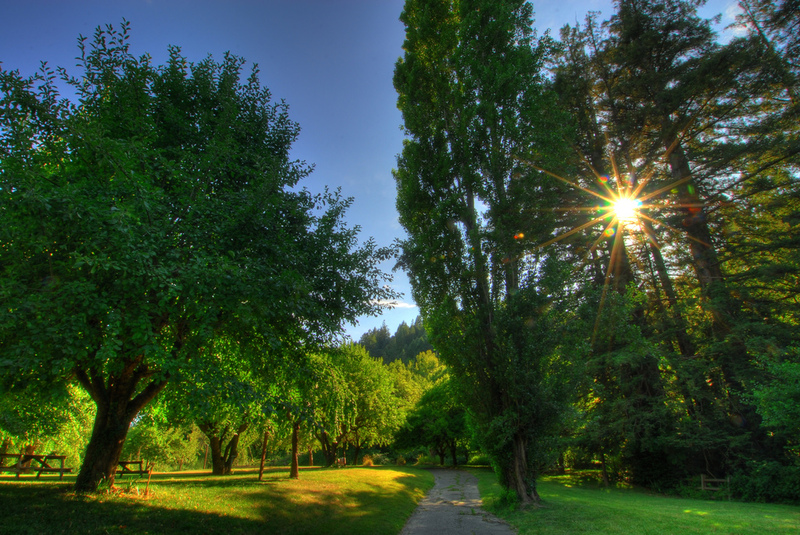 Many of these are sites our users have found helpful for planning their own trips. You can either type in your own search term in the box (e.g., "beachfront condo") or just click one of the links below it. And Planapple doesn't just link to these sites, it actually fills in their search forms for you with your destination and travel dates whenever possible. So if you're looking for (say) hotels or airline tickets, you don't have to keep re-typing your trip details at all those other sites.